Discover Savannah’s history and architecture on this guided, 2 hour, small-group walking tour. 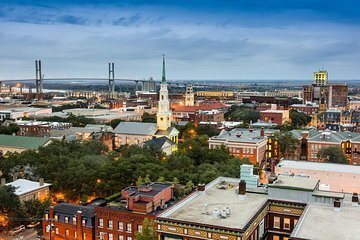 As the largest National Historic Landmark District in the US, Savannah offers more than 20 city squares filled with historic homes, museums, churches, mansions, monuments and the famous forts of the Revolutionary and Civil War eras. Explore the varied examples of Federal, Victorian Regency, Greek/Gothic Revival and Italianate architecture and learn about the history of this great city from the tour guide. Moderate walking of about 1.5 miles throughout the morning tour. Very informative. Knowledgeable guide. Would recommend . So much to see in Savannah . It was just my husband and I. We were the first on the tour and there was no history or architecture. We did get the hop on and hop off which was nice.